This page provides links to downloadable PDF versions of all our printed literature and reference materials. Our 15-page white paper, "Equipment Solutions for the Brazing of Diamond Tools", provides general overview of the diamond tool brazing process, and reviews recently developed equipment used for the brazing of the components. Check out our machine image gallery to see what we've been building lately – turnkey industrial heating solutions with our own production-proven tooling & fixturing designs, power supplies, and inductors. 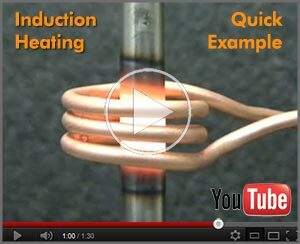 The video clips on our YouTube Video Channel show how induction heating can be used for brazing, annealing, heat staking, and many other applications. This page provides brief profiles and web links for our business associates. Use this convenient online form to send us along with samples of your parts. Use the form to tell us about your process - we'll analyze your application requirements, determine the optimum combination of RF power and coil configuration for your parts and give you our best advice!